Well, another weekend of hot weather in the valley led me wondering exactly what to do on this fine Sunday. 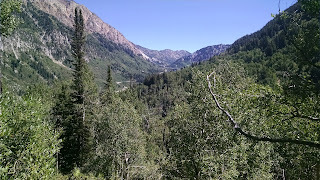 On deck was making yet another trip out to Wendover or heading up north and doing some exploring. I was totally ambivalent on what to do and couldn't find anyone to do anything with. 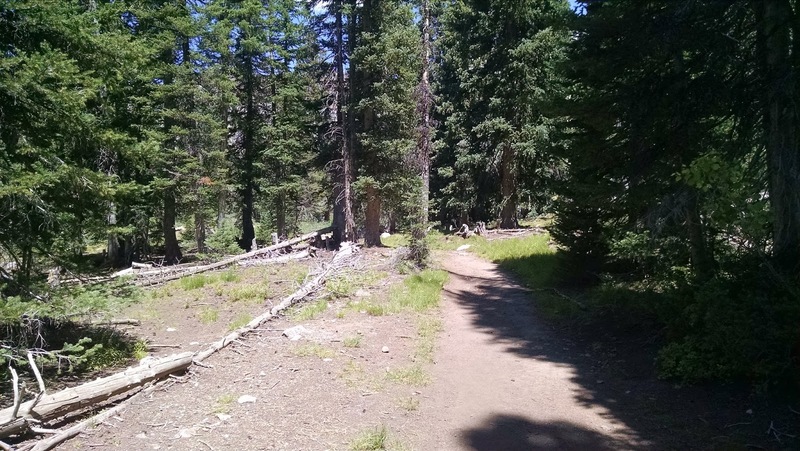 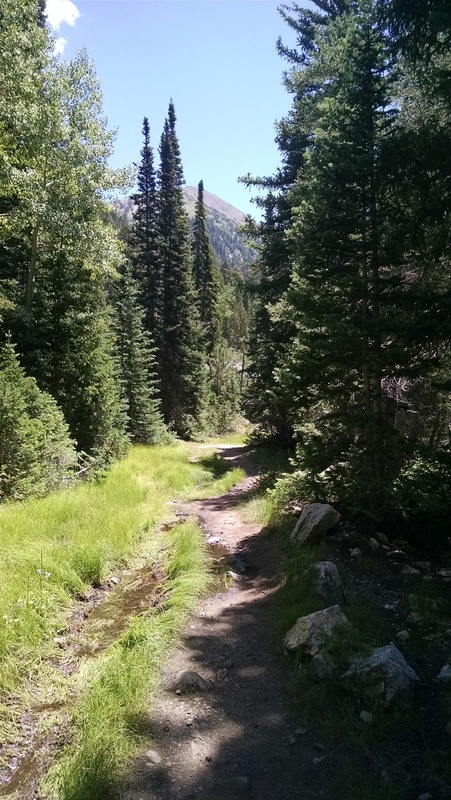 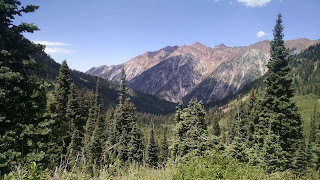 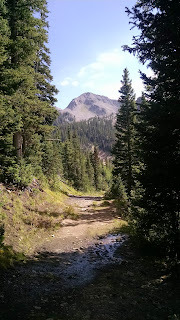 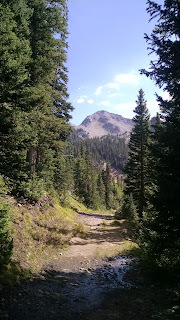 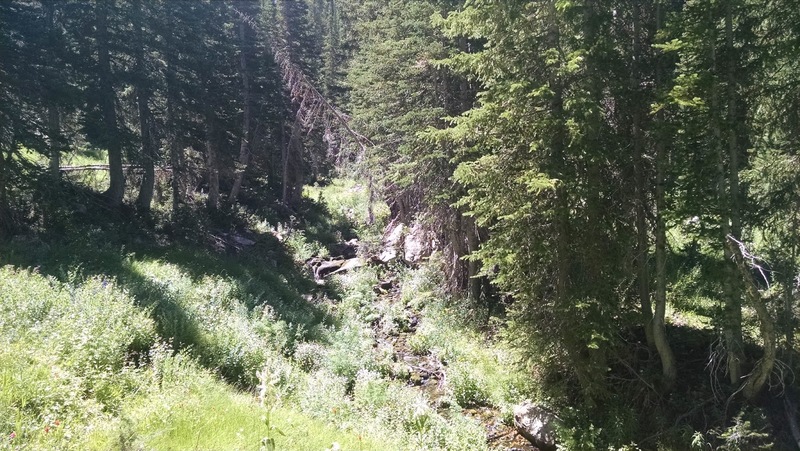 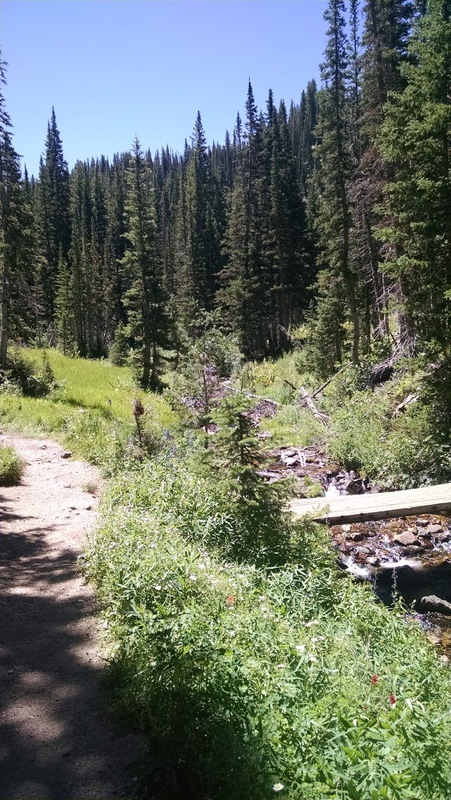 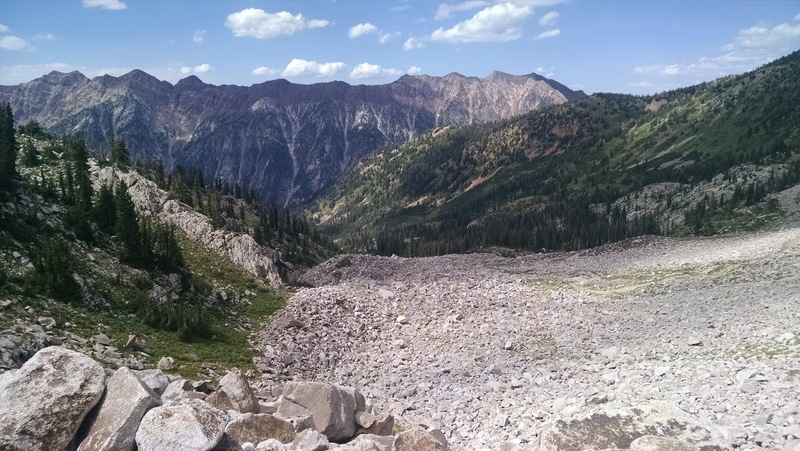 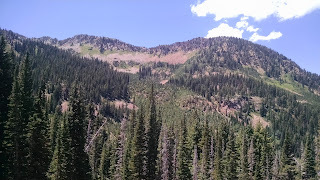 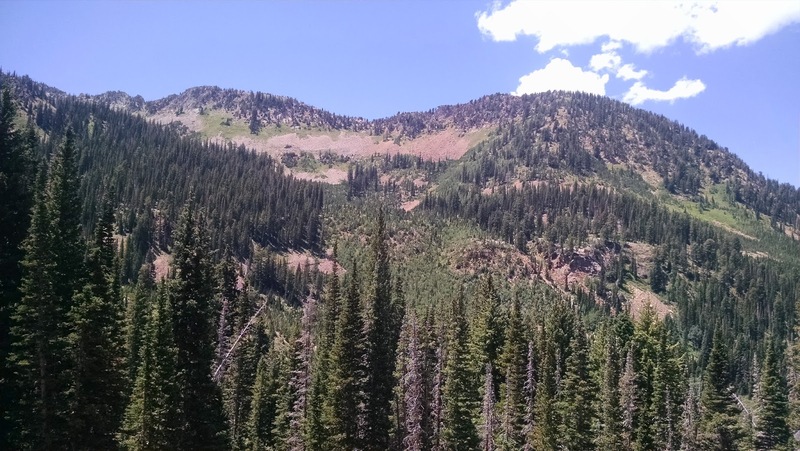 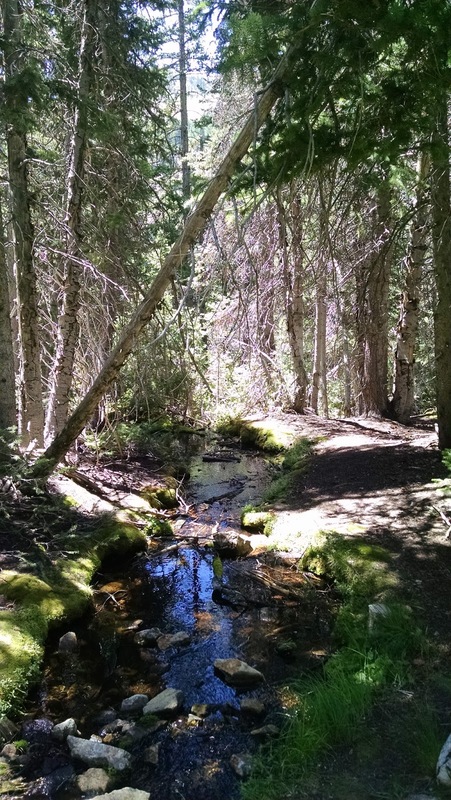 So instead of driving around, I headed back up to Alta and did the White Pine Trail's sister, Red Pine Trail. 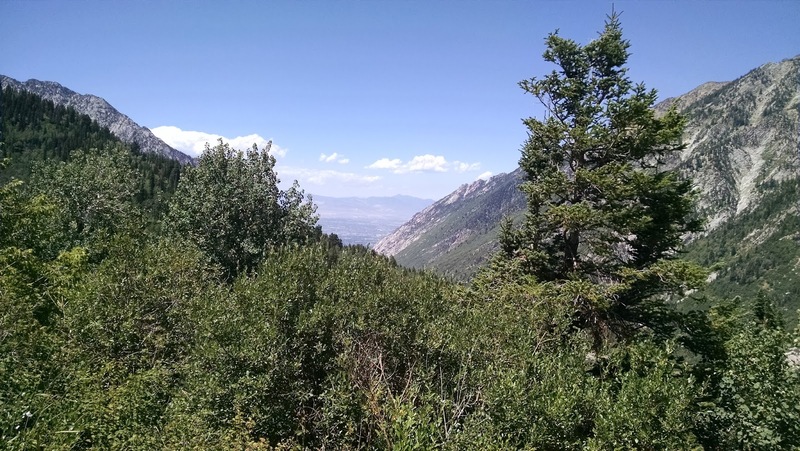 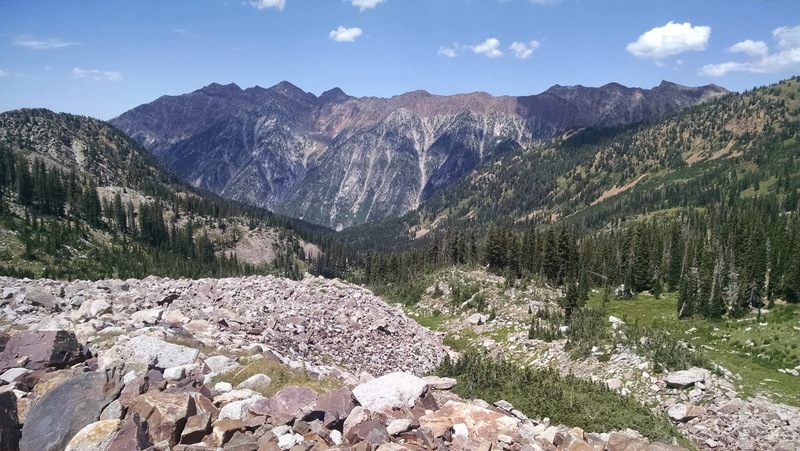 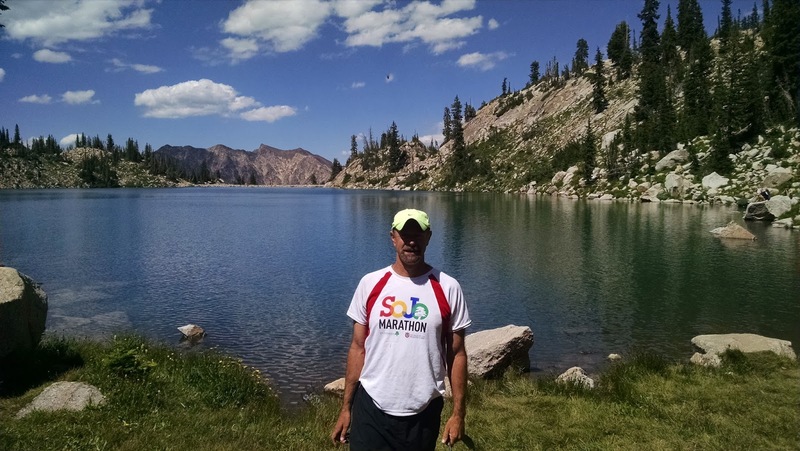 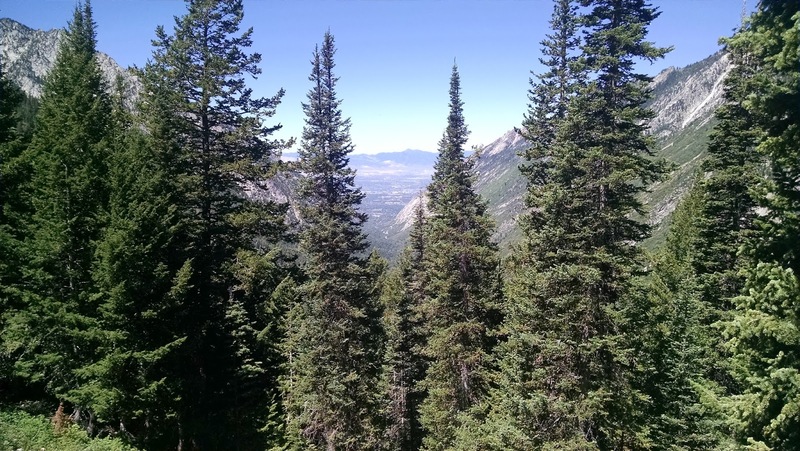 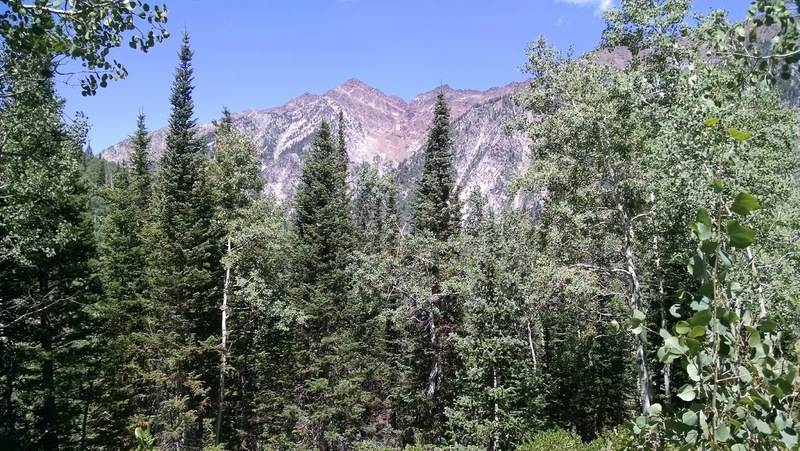 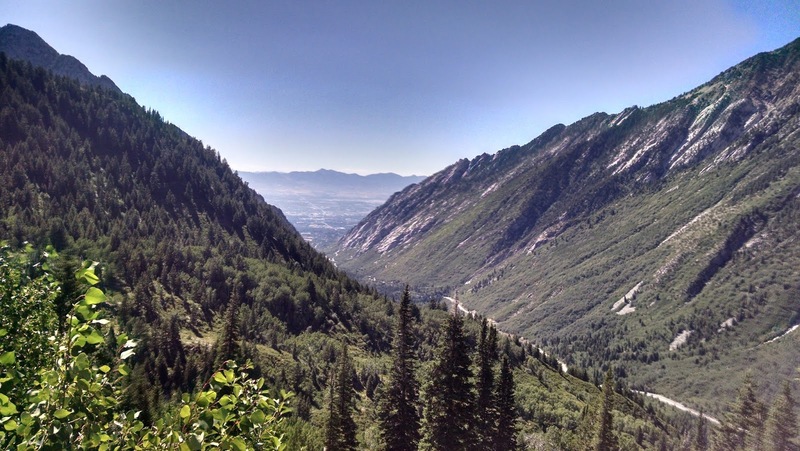 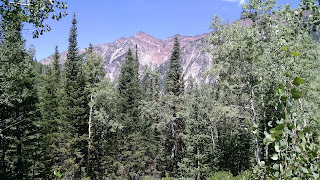 Casual readers may recall I did the hike in 2013 with a friend of mine, which you can read here. 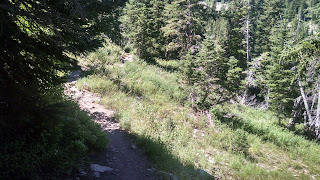 This trail is short but not easy. 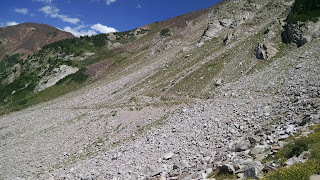 It is almost all ascent. 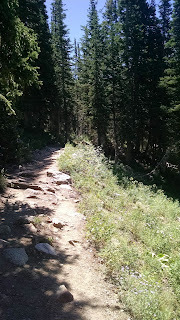 I didn't measure it this time with my Garmin, but reading about in my prior post put it at 3.25 miles or so. 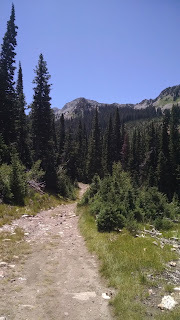 I managed to make the trek in about 90 minutes and that was hoofing it at a solid clip. 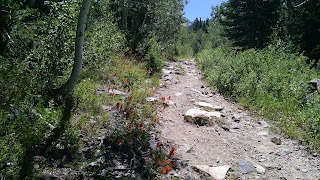 With the temperatures pushing the upper 80's in the valley, this trail certainly didn't feel very hot. Most of the trail is shaded and heavily wooded. 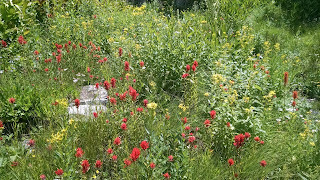 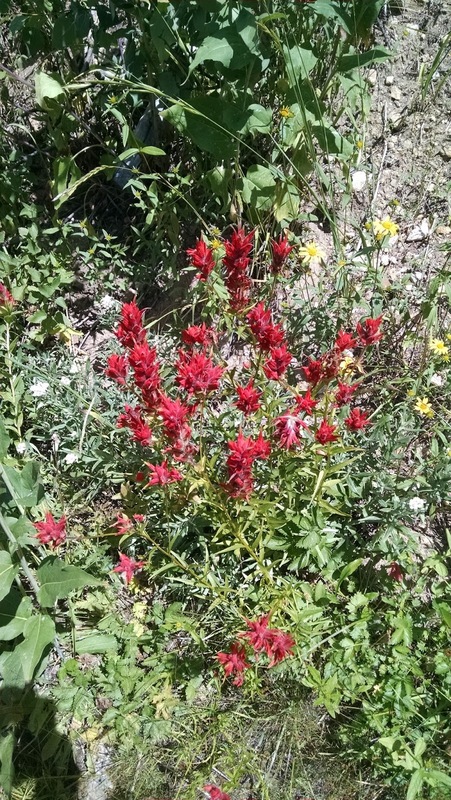 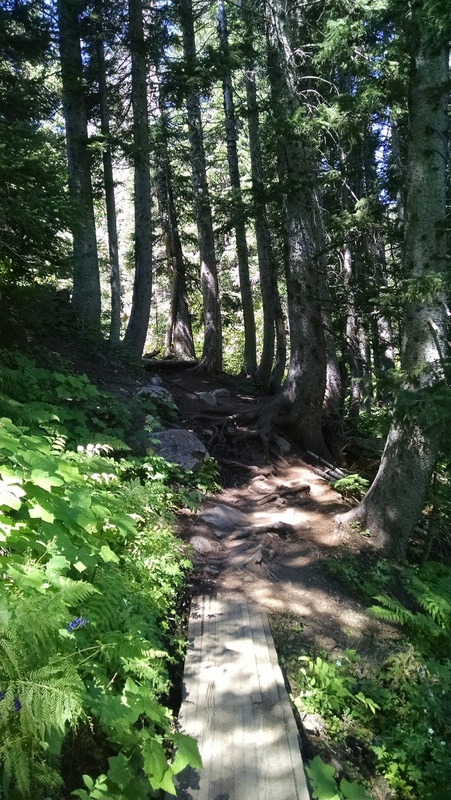 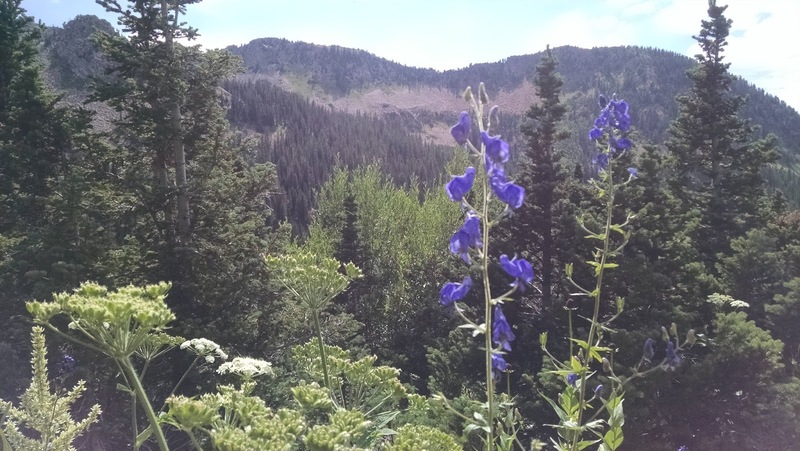 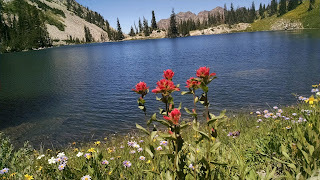 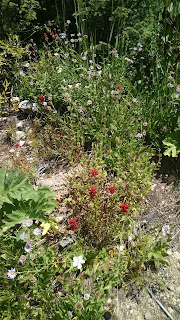 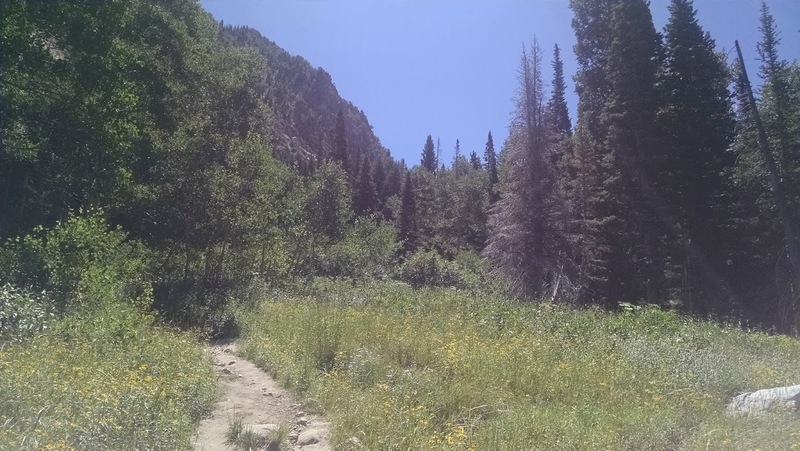 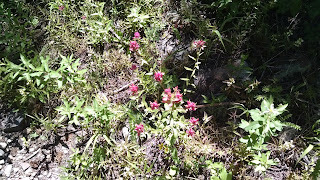 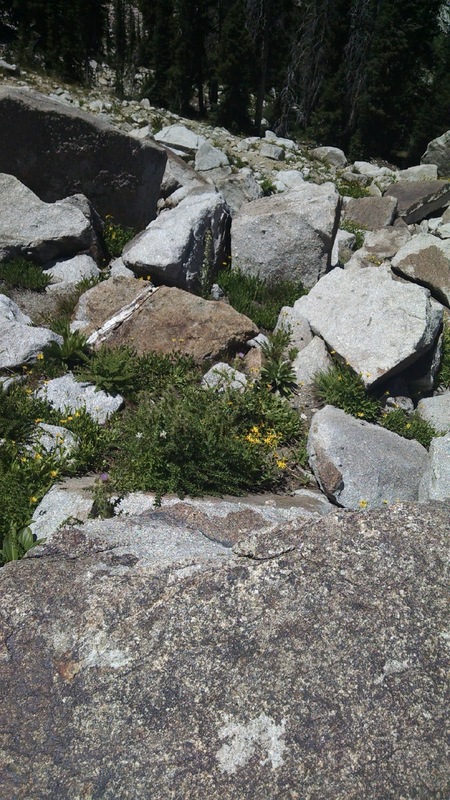 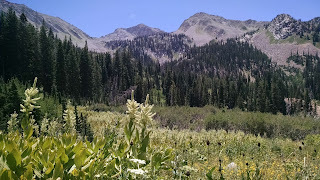 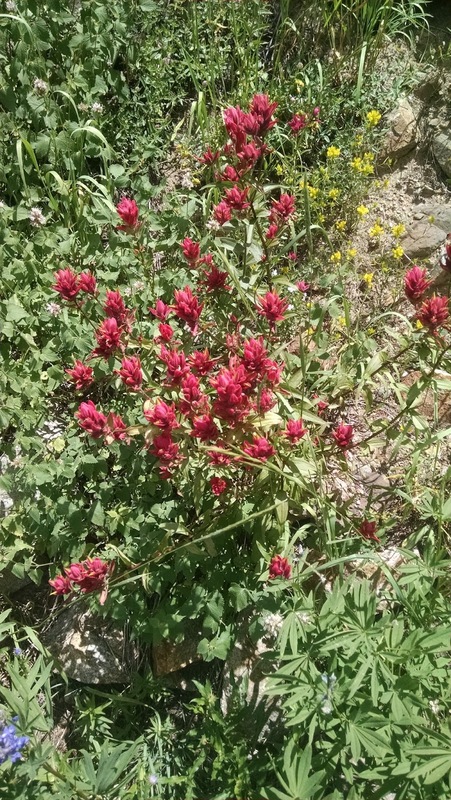 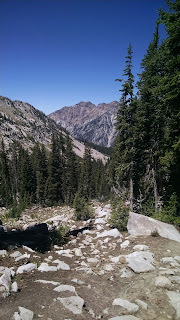 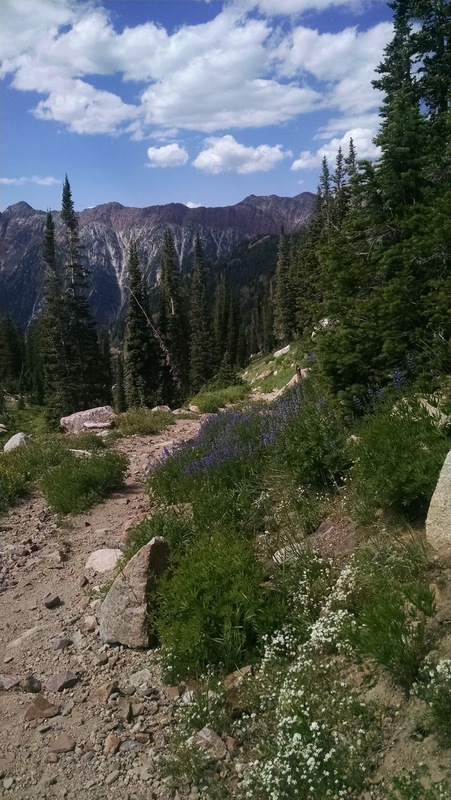 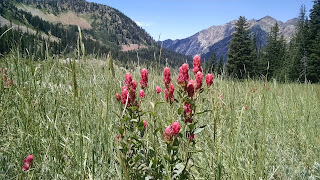 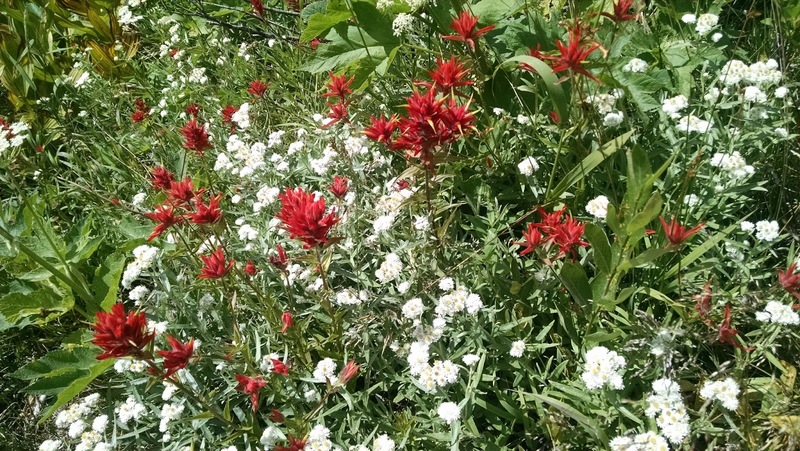 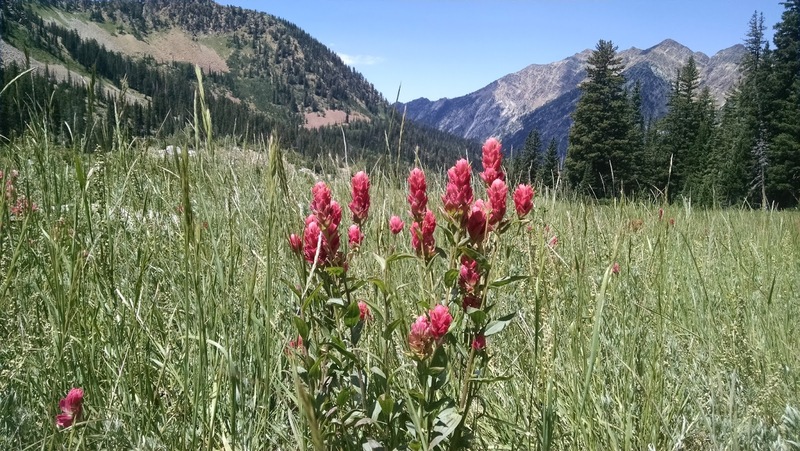 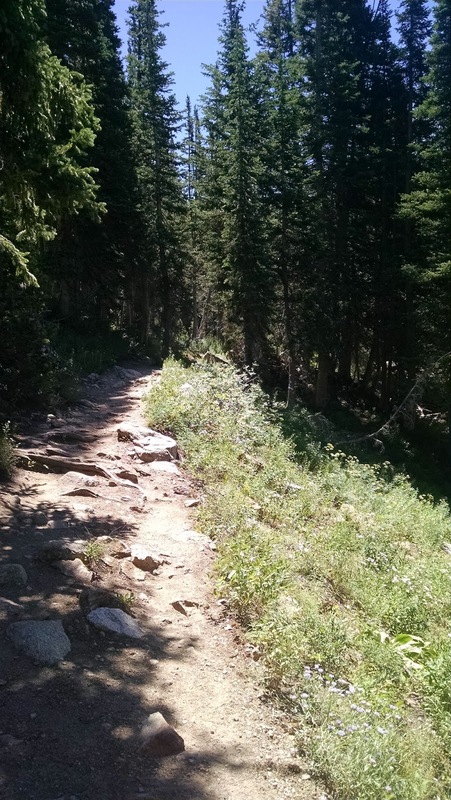 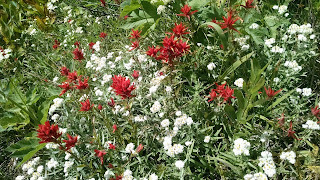 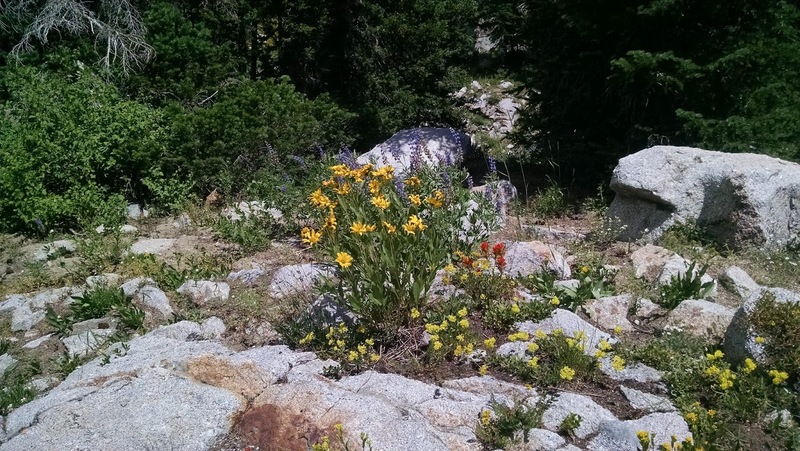 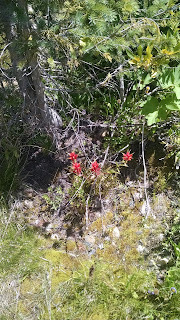 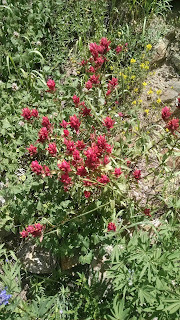 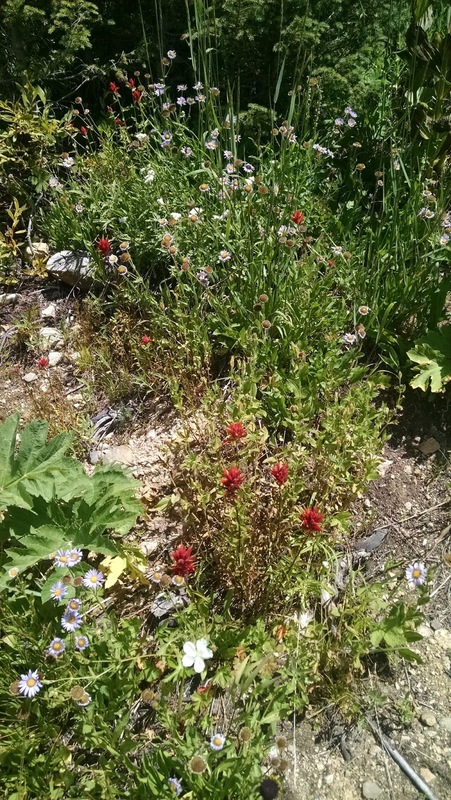 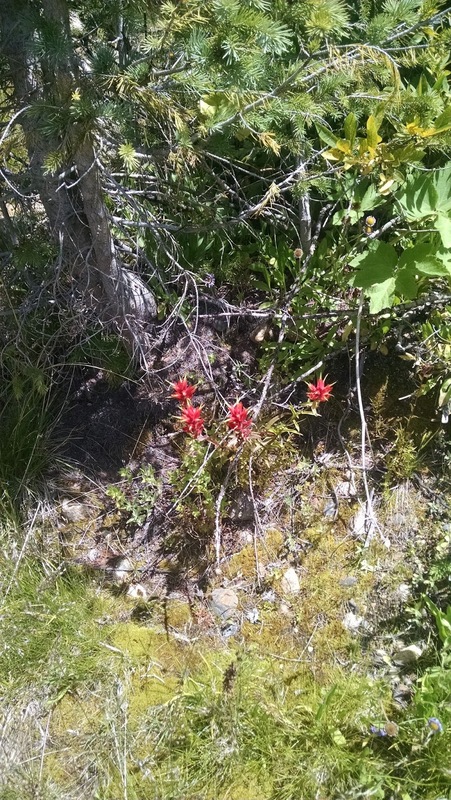 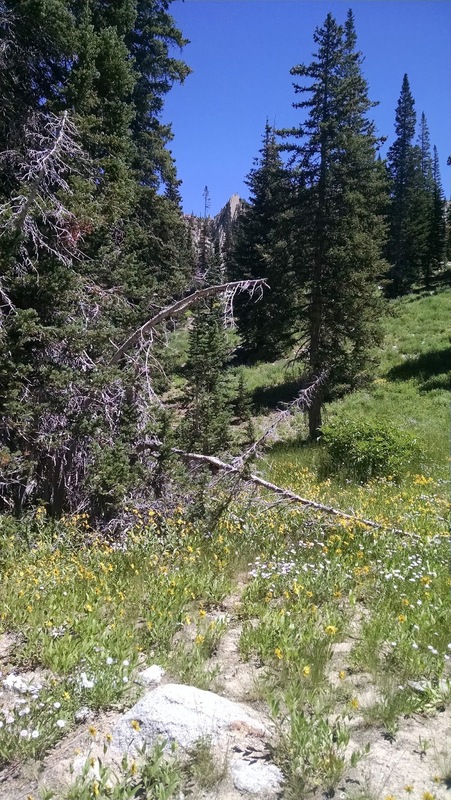 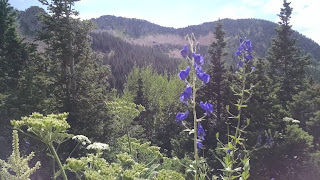 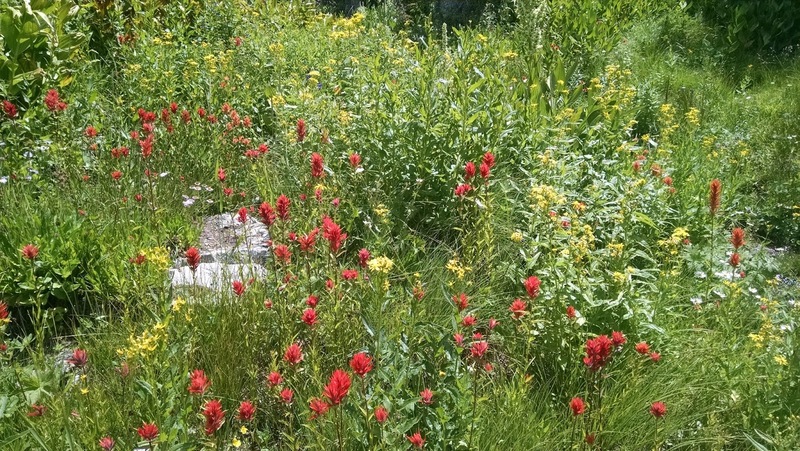 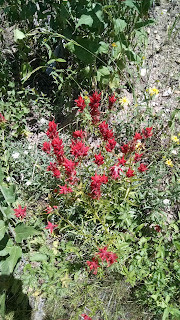 There were some wildflowers on the way up, but most of the trail is either heavy pine or cedar. 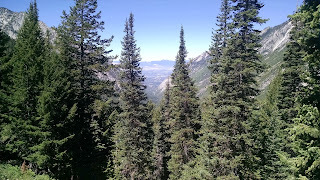 Also about a third of the way up you are treated to some really great views of the Sandy Valley. 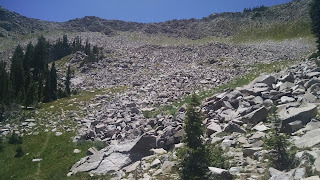 There is a lot of scrambling as well as some muddy sections on the way up to Red Pine and I saw a number of people gasping for breath. 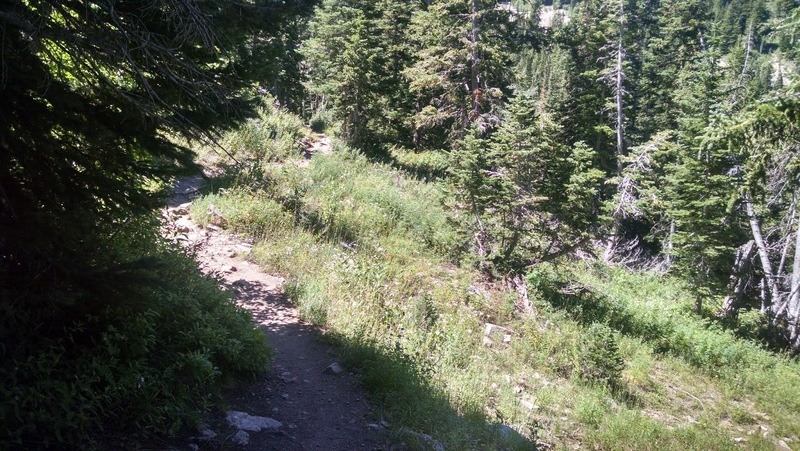 This is really a good glute and quad burner. 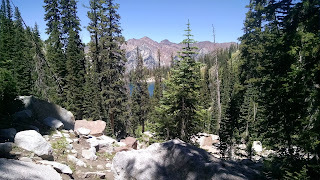 Finally I made it to the top and the lake was just as scenic as I remembered. 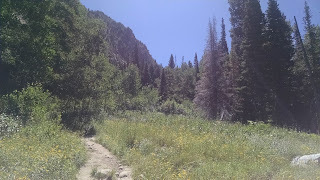 I wound up cruising around the side of it. 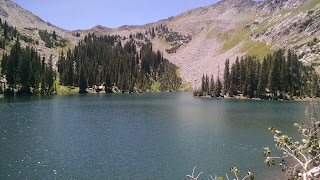 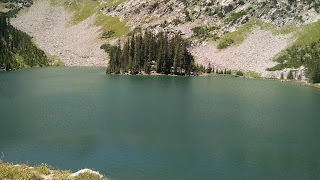 I had the studied the topography maps before I had left and I knew that there was another lake behind and above Red Pine. 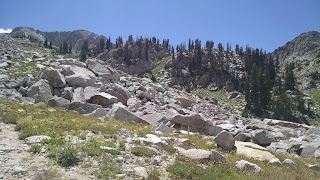 I had never visited those and I was curious as to what they looked like. 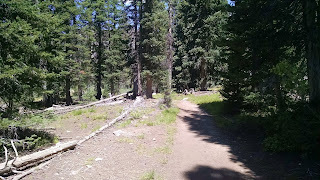 I asked around and found a few people who had made their way back behind Red Pine. 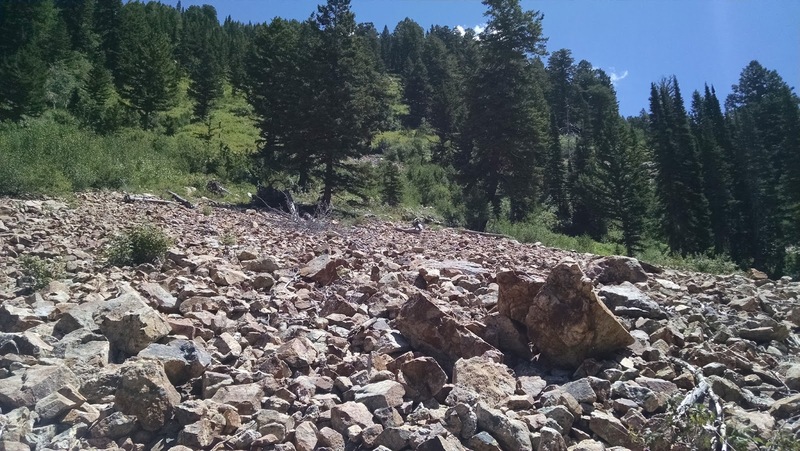 Basically the trail climbs a massive rock hill. 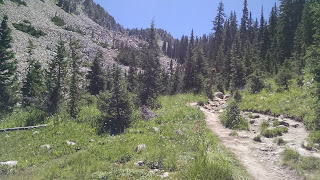 The trail at this point is very hard to make out and it is hard to guess what the best way up is at times. 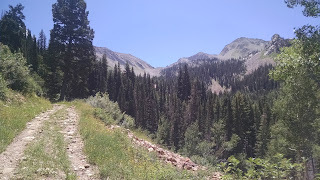 I managed to follow the trail and every time I thought I had lost it, I found it again and within about 15 minutes I made it to the top. 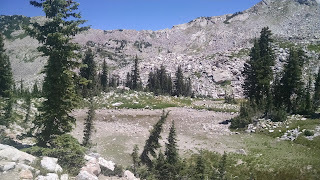 And discovered a tiny little puddle of a lake... Seriously it was a puddle. 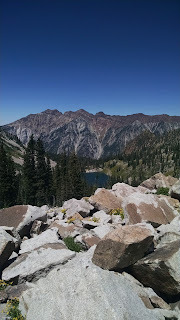 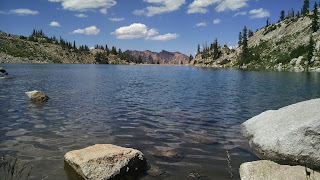 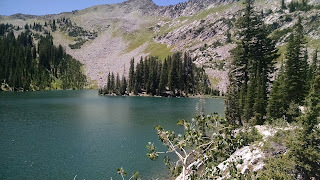 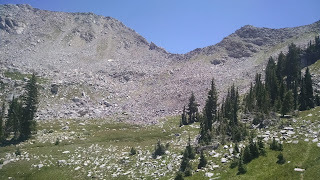 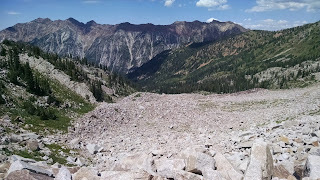 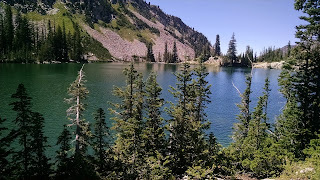 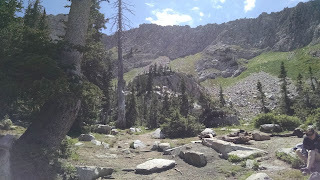 I sighed audibly and low and behold another guy was heading down from above me and I said "That's Upper Red Pine Lake?" 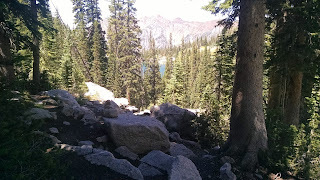 He said no and made me look in between a pair of trees shimmering in azure blue was another pair of larger lakes. 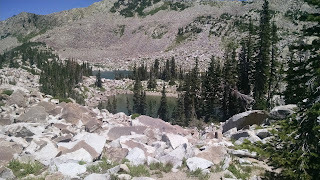 I managed to make my way over there, but again there was no discernible trail and also the lake didn't look too interesting. 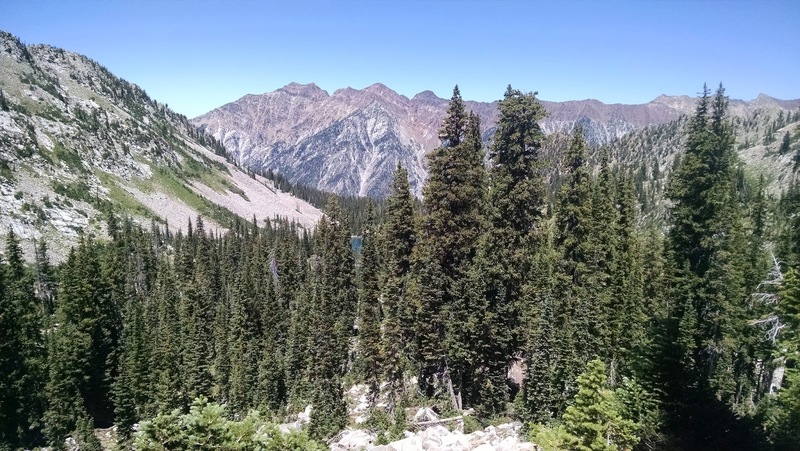 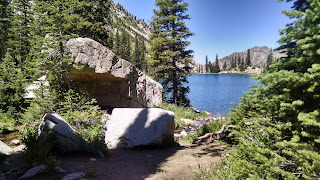 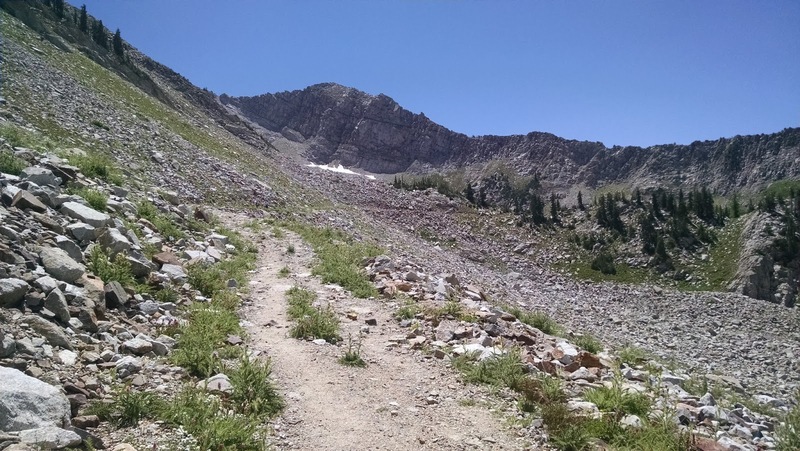 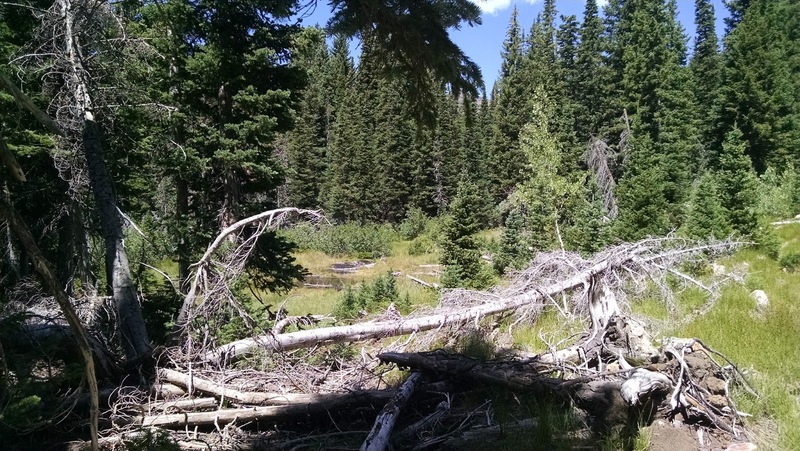 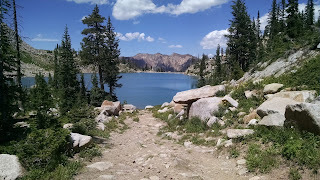 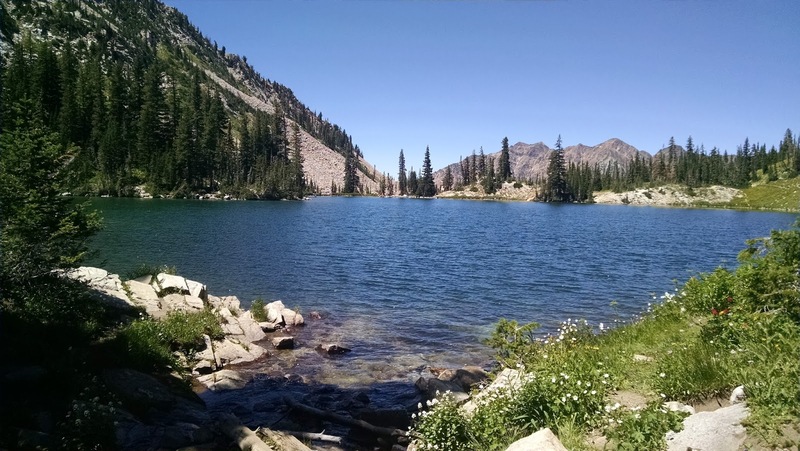 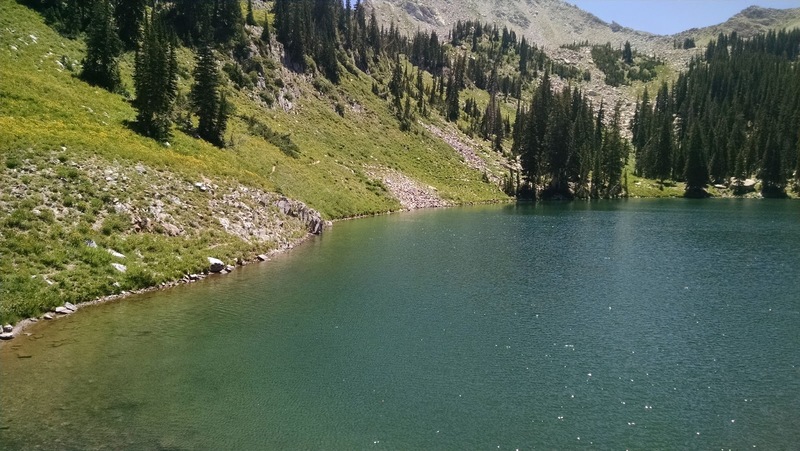 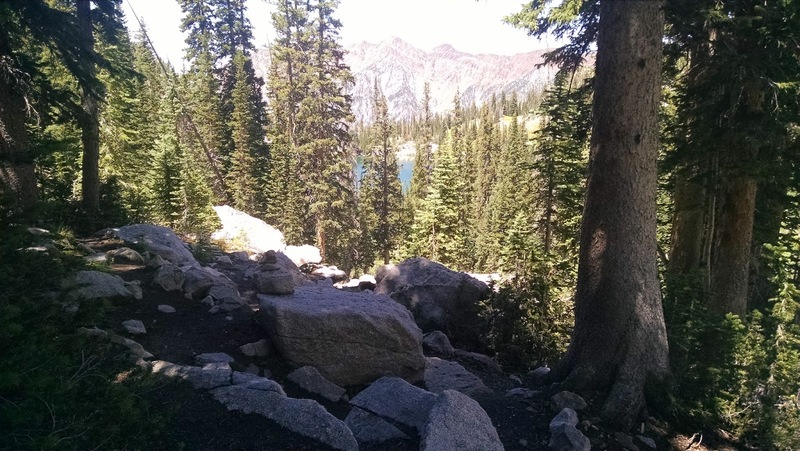 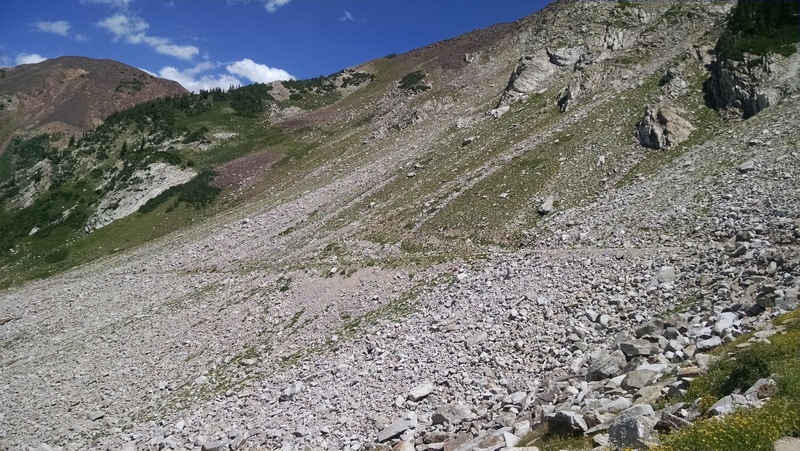 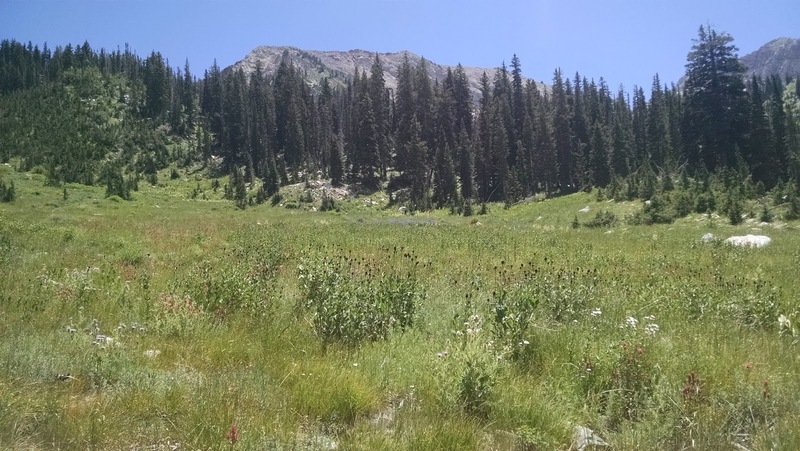 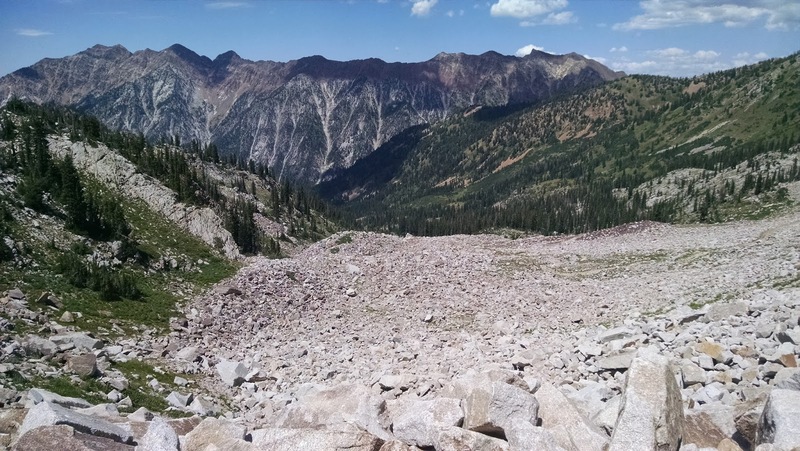 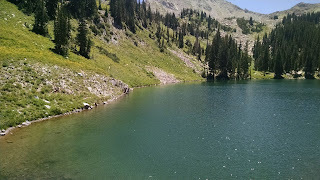 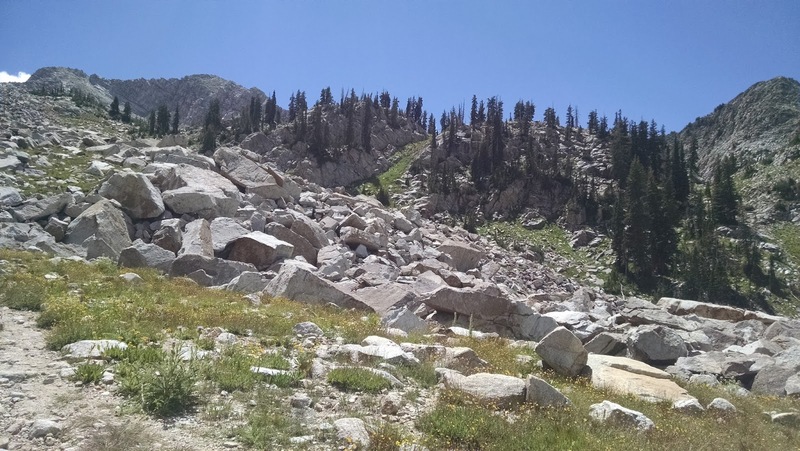 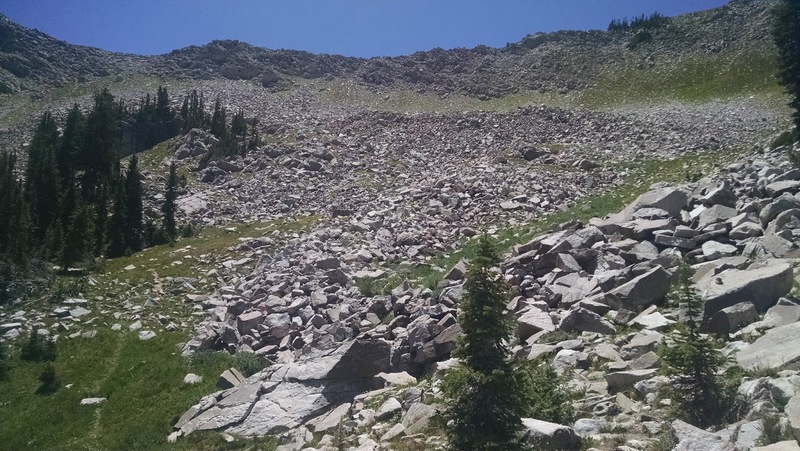 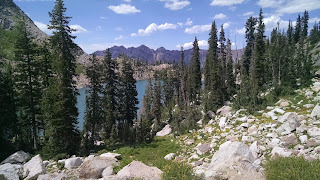 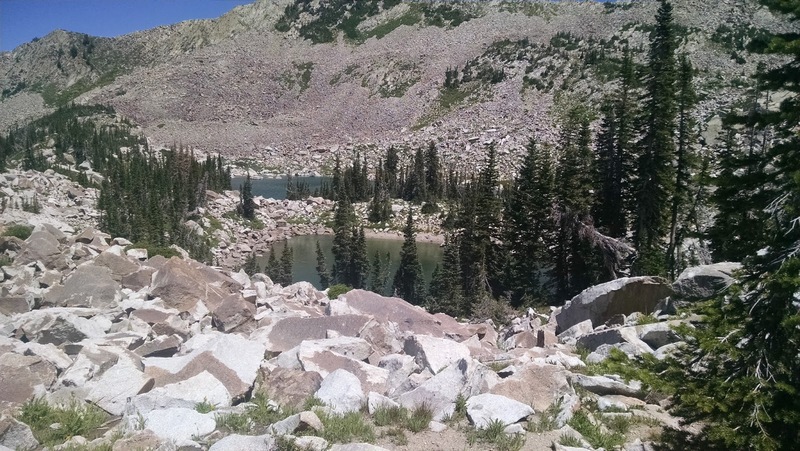 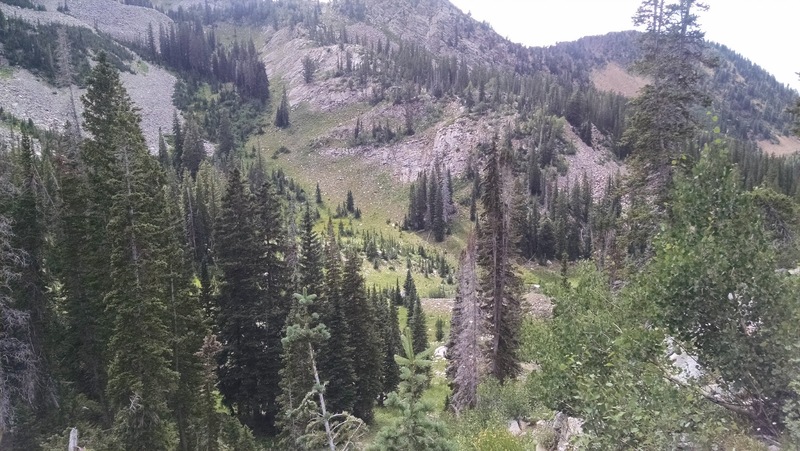 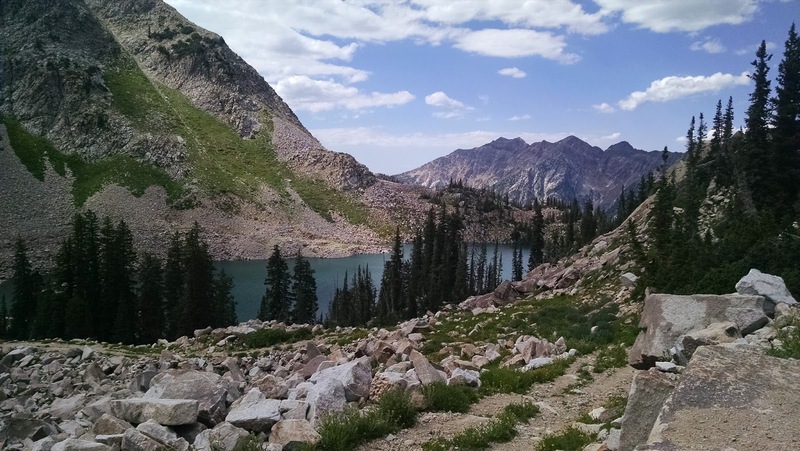 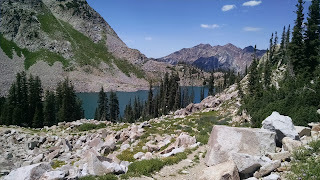 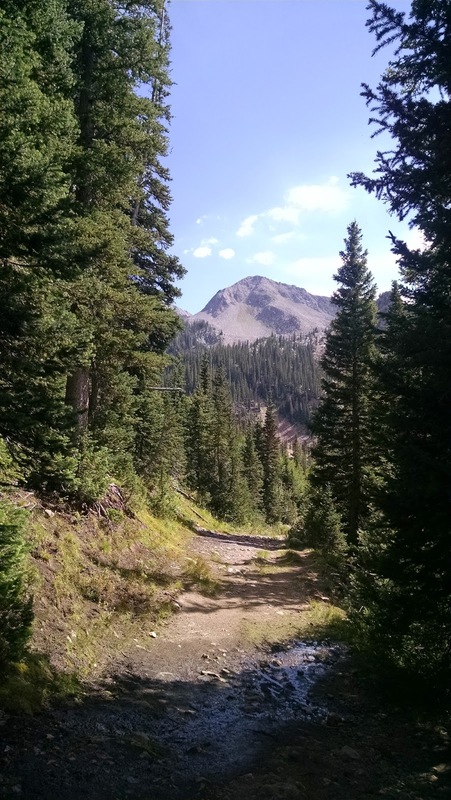 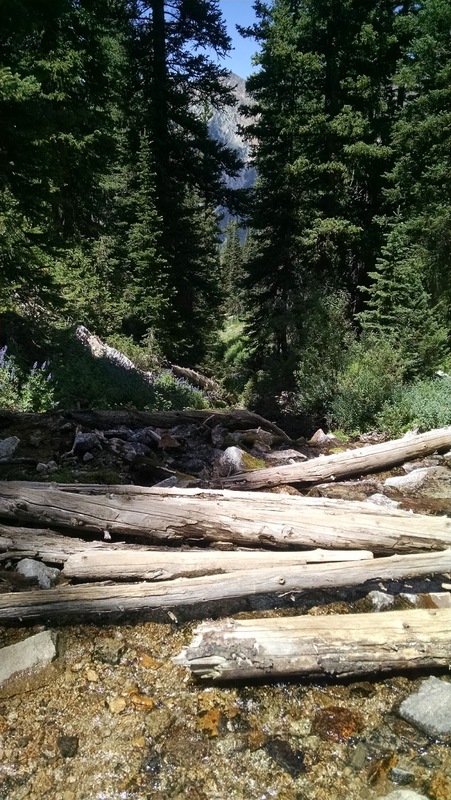 I really don't like trail blazing and while I knew exactly how to get back to Lower Red Pine Lake, anytime I am 100% by myself in an area I don't feel comfortable in, makes me want to not explore much. Just too easy to slip and fall up there and so I wound up making my way back down to Lower Red Pine. 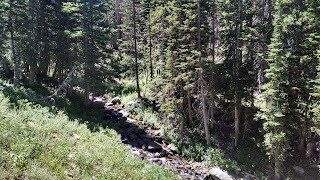 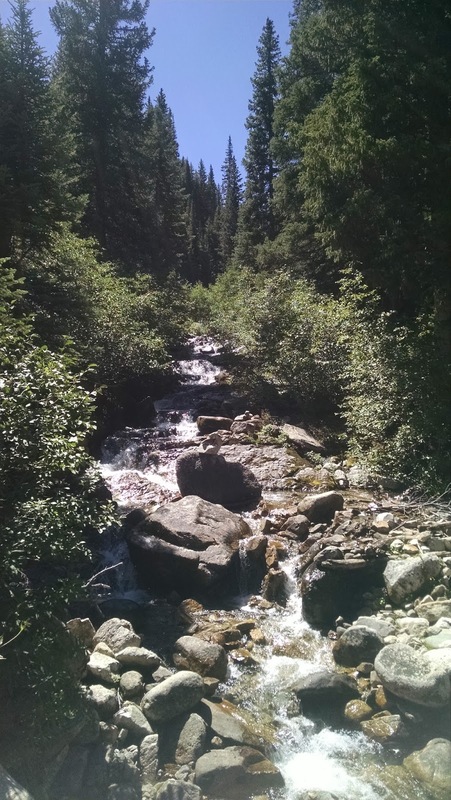 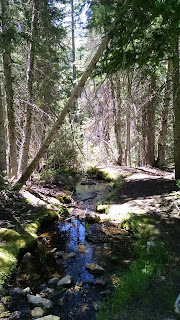 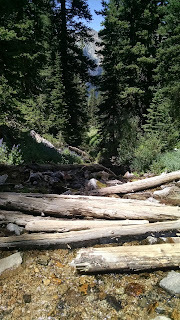 I wound up sitting with my feet in the creek as I enjoyed the cool breeze, the sun and the view. 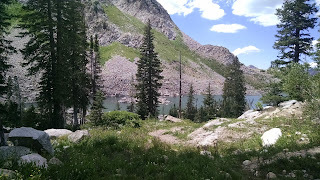 Just an absolutely perfect day.